Movies in Mind is a one-day festival that will take place at Nerve Centre, Derry/Londonderry, from 9-10 October, aiming to support the arts and challenge preconceived ideas about mental health. Filmmakers, students and scholars from around the world will show their films, share their insights and innovative research, and participate in lively conversations with the audience. Members of the mental health community will also share advice and their experiences. - Dr Victoria McCollum, Lecturer in Cinematic Arts at Ulster University. Movies in Mind opens in the Nerve Centre with a special fifth anniversary performance from Six Strings & Stigma. The Six Strings & Stigma album launched in 2013 and is inspired by the true stories of local people struggling with their mental health. The evening will feature live music from Ruairi O’Doherty, Jeannette and Noella Hutton, Paddy Nash, John Deery, Decky McLaughlin and Roy Arbuckle. Barry McGale from Suicide Bereavement UK will open the event. 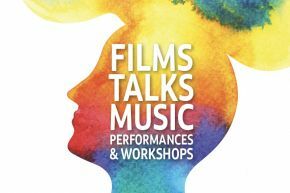 A series of Creative Arts Workshop sessions, with a focus on mental health and wellbeing, will be available to participate in, ranging from music and comedy to cinematic arts. Roy Arbuckle will focus on how voice is breath and breath is life in his Music and Mindfulness Workshop. The workshop is open to everyone and will show participants how to connect to your breath and your voice with a few simple exercises. Feeling Funny (Comedy for Connection and Confidence) is delivered by local artist Sorcha Shanahan who forms one half of the Makeyuppers. The workshop will be a fun and playful exploration looking at how play, games and having fun can reconnect us to ourselves and others. Cinematic Arts and Drama PhD candidates from Ulster University will also screen a range of short films including Quiet, a story of economic uncertainty, by playwright and filmmaker Don McCamphill, Far From the Reach of the Sun, an LGBT/queer short, by Dublin visual artist Kevin Gaffney, and new work, on conflict and identity, by award-winning Iranian video artist Hamideh Javadi Bejandi. This FREE event is a collaboration between Ulster University (Cinematic Arts and Drama) and the Ones to Watch Young Programmers at Nerve Centre. Refreshments will be provided!